David Letterman’s return to TV (and computers, and phones, and pretty much any device that can run apps and has a screen) is only a week away, Netflix announced today. 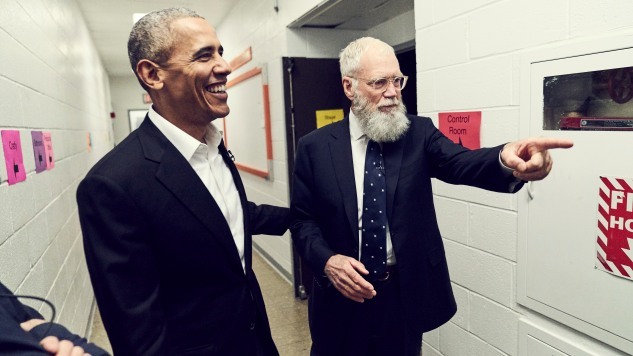 The legendary comedian’s new talk show, My Next Guest Needs No Introduction with David Letterman, will launch exclusively on Netflix on Friday, Jan. 12, 2018. And his first guest really needs no introduction: it’s former president Barack Obama, which will mark his first talk show appearance since leaving office. Letterman redefined the late night talk show in the 1980s with NBC’s Late Night with David Letterman, influencing an entire generation of comedians and comedy writers in the process. In 1993 he left NBC for CBS after losing out on The Tonight Show, with a 22-year-run on The Late Show with David Letterman that made him one of the highest paid performers on TV. During that time he engaged in affairs and behind-the-scenes behavior with employees that wouldn’t be tolerated in today’s post-Weinstein climate. After his retirement in 2015 he’s kept a relatively low profile; My Next Guest is his first major TV project since the end of his Late Show run.